My name is Rosemary Sugh. I am the fourth born of my mother from the family of five. I am from Kwande local government area. I was born on November 14, 1992, I am, therefore, 21 years old. 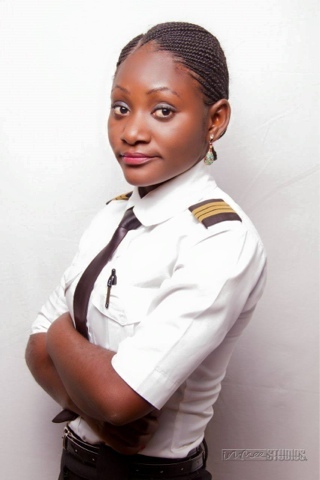 What prompted you to go into the aviation industry? It was my childhood determination. When I look up and see planes flying and making noise , I was like, God, I have to be a pilot. And it helped me in the sense that the kind of movies I watched, one of the movies was Starship Trooper. When I watched that movie I saw a women flying because. There was a lot of discouragement from my parents and other people. They assumed that if you are a lady and you are a pilot, you may not marry, you can’t cope with marriage. So, when I saw a lady in that Starship Trooper, I was moved. I said wow, if this girl can fly, then I can fly. And I put it into prayers, despite all the obstacles and discouragement. Okay, what did you discover when you went to the aviation school? I found exactly what I always thought of, I found what I wanted – to get into the cockpit and get an aircraft fly into the skies. Before getting into the aviation school, what was your educational qualification? I went to three secondary schools; the First one was Government Day Secondary School, Uke in Gboko. The second one, I started SS 1 which was at St John’s Secondary School. I was made the assistant head girl of the school and after my exams, I failed Mathematics. I went back and registered for a re-sit of my exams at St Francis Secondary School, Ikurav-Ya, Ikyogen and I got credit passes in eight subjects, that was what helped me. After that I also did my computer studies at Miracle Computer Centre in Kaduna State. Have you been able to update your qualification after you left the aviation school? That’s what am doing right now. I’m in one hundred level at the university right. I mean the Open University. As a pilot, what will you do if you are not feeling strong? I don’t fly, if I don’t want the organization to feel bad I will say I am not fit to fly. Because it is a rule that if a pilot is having headache, he should not fly, if a pilot is having a little fever he should not fly at all. You save yourself and the lives of others who would have flown with you if you insisted to fly. So, as a girl are you not afraid of heights, I mean high altitudes? I’m not afraid because I remember when I started flying alone, if you are flying alone it is a strange feeling, they told me not to go beyond 8,000 feet to 9,000 feet but determination forced me to do otherwise, so I actually hit 11,000 feet. So, you flew above 9,000? Yes, I was maintaining 11, 000 feet because where you are going determines the kind of altitude you maintain. So, I maintained 11, 000 feet in the sense that, you know we have tall mountains in Jos, so, if you are going there you have to be careful of the kind of altitude that you maintain otherwise you may crash into a mountain. So, I decided on my own, nobody told me because I was alone and decided to maintain 11, 000. Guess what? There were very high mountains everywhere and I discovered that the experience was wonderful. Yes, I was alone. You must fly in that route alone to prove how competent you are. I flew from Zaria to Jos, then Kano and back to Zaria. I spent like five hours in the air because it is a small engine, it doesn’t move fast. It covers 1.5 nautical miles in one minute, so that’s what made me spend like five hours but if it is a heavy duty machines, it’s different. How did you feel after you landed? I felt like a complete pilot, I’ve fulfilled my dream. So, which plane did you fly? I have flown three planes so far and am ready to fly more. I flew TD9, that was the first one I started my training on. The is the first plane anybody who is going to train in Zaria will start with. We call it TD9ner, in the aviation language, that is the way we communicate. Then the next one was TD20, then the third one was a Multi Engine, B68. It’s a three-engine actually. So, how are you relating with your friends? Actually, every friend will feel good, some will feel jealous and some will be envious. It’s normal.